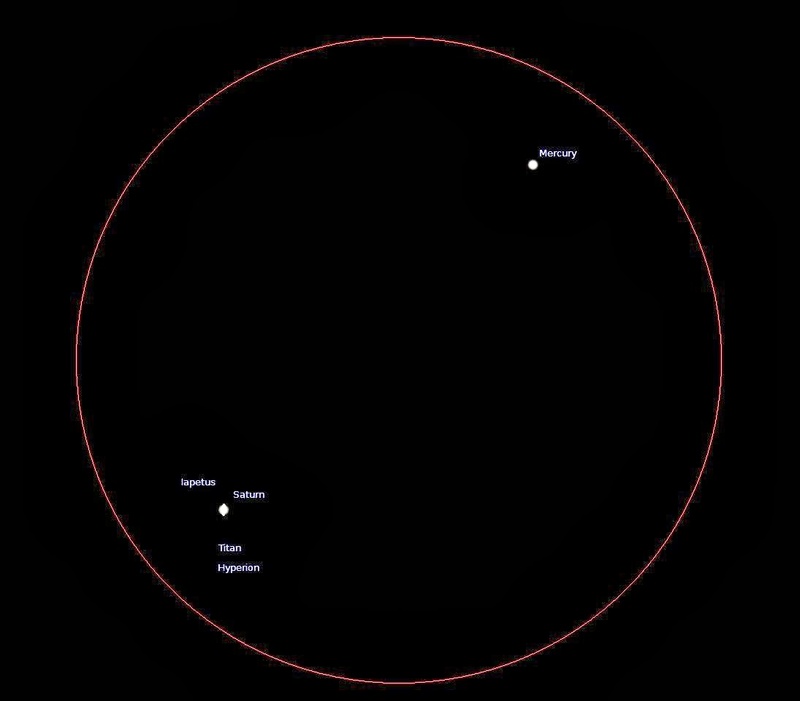 Mercury and Saturn will get very close to each other as seen from Earth in the early morning of 26 Nov 2013. The bad news first - it will be extremely challenging to see them from Singapore. Even if you do manage to see them through a telescope, chances are you will not see a very clear sharp view of Saturn and Mercury. This is because they will appear very low in the horizon where the atmosphere is thickest (thus creating more distortion to light) and they appear very briefly before the brightness of twilight overwhelms them. The higher probability of clouds near the horizon and the ugly sky glow in light-polluted Singapore is not helping too. Now, the slightly better news - it is not impossible to see them through a binocular or telescope *IF* the sky is just clear enough and you know exactly where to look for them in the sky. Mercury and Saturn so close their text label overlap each other! - Find a location with an unobstructed view of the East. - Use an accurate compass to locate 105 degrees East-Southeast (ESE). - Locate the portion of the sky roughly 5 degrees above the horizon facing 105 degrees ESE. This is about half the height of your fist on an extended arm. - Point your binocular/telescope at that spot in the sky and observe patiently from 5:45am till about 6:05am tomorrow early morning before sunrise (Tuesday 26 Nov 2013). 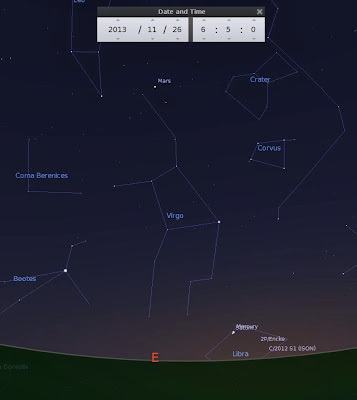 - If you have a computerised telescope system, then just let it search and track Saturn or Mercury during this period. If you are successful, you should see 2 very dim "stars" very close to each other through a binocular. And maybe even the rings and moons of Saturn very dimly through a telescope. The idea is to see 2 planets in the same field-of-view magnified through an optical instrument which is a relatively rare view. Typical view through a wide-field telescope in low/medium magnification. The above image shows how close they are - less than half an arc degree apart. The red circle indicates the apparent size of the Moon (which is half an arc degree). This means just like the Moon, you can cover both planets in the sky with the width of your pinky fingertip (about one arc degree) on an extended arm! The fact they are so close also implies one may use more magnification on a long focal length telescope and still fit both of them in the same view and see slightly more details of Saturn (e.g. the rings and moons of Saturn). Clear skies and good luck hunting! Finally, a documentary about Comet ISON that will be seen by the public in Singapore! National Geographic will be screening the documentary "Comet of the Century" via Singapore's StarHub TV and Singtel mio TV. Also glad to hear from Justin a few days ago that his photos of Comet ISON will be featured in the BBC documentary Comet of the Century: A Horizon Special a couple of days ago (not viewable online in Singapore). I believe he is the only Singaporean photographer credited in that programme. Speaking of comets (and meteoroid, asteroid), one of the most frequently asked question is "will it hit Earth?". SPACE MYSTERIES (Episode 2) "COMETS: TARGET EARTH?" Looking forward to comet living up to its expectation and visible with naked eyes in December! And more comet photographs from local photographers! 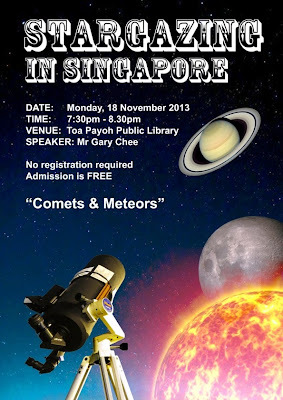 The next public stargazing talk I will be conducting is titled "Comets & Meteors". 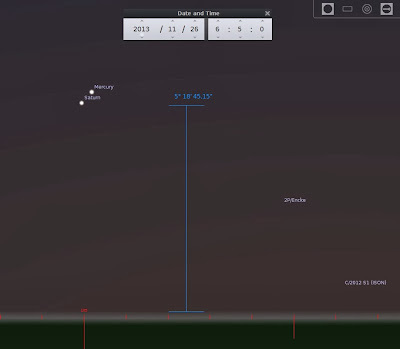 Learn about the difference between comets and meteors and the upcoming meteor shower periods. The main focus for this talk will be the *potential* Comet of the Century comet ISON! 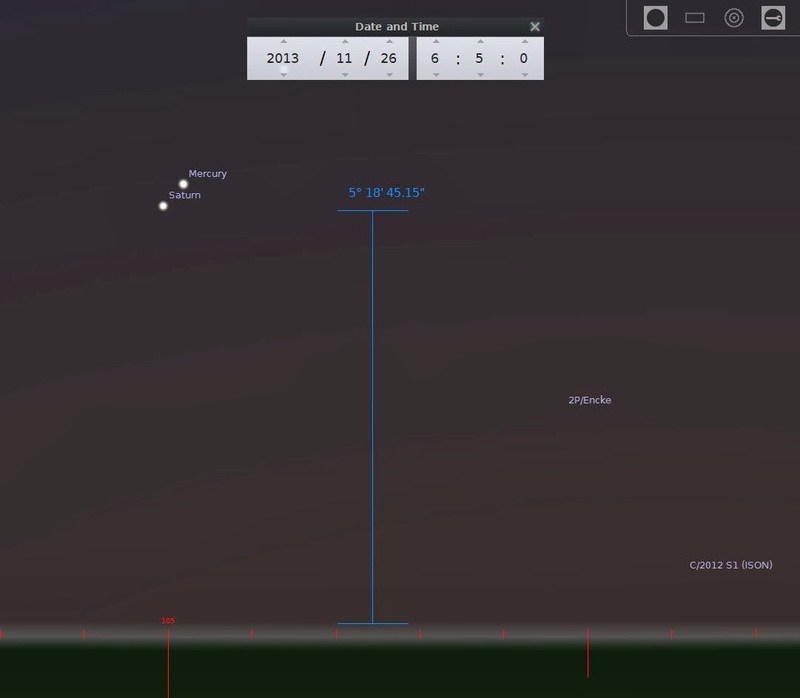 Acquire some basic stargazing skills to locate this comet in the sky. You may then be able to observe it through binoculars or telescopes and even take a photo of it! *Weather permitting*, during/after the talk, there will be an impromptu live stargazing session at open space just outside the library. 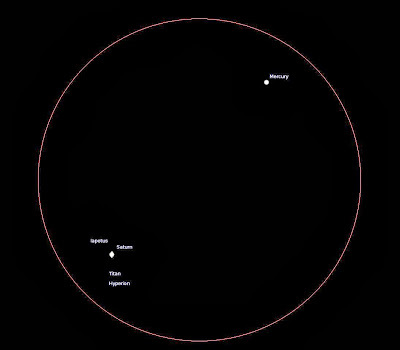 You can observe stars, Venus and Moon through our telescopes! So bring your family and friends along and acquire skills that will enable you to enjoy stargazing for the rest of your life! First confirmed visual report of Comet ISON seen in Singapore early this morning (16 Nov) by veteran local amateur astronomer Gavin! *WEATHER PERMITTING*, this is how to find the comet early morning tomorrow before sunrise (17 Nov) from Singapore. (1) Face east. Locate Spica before 6am. Take a mental note of ISON's location from Spica. (2) Find L-shape star pattern through a binocular or telescope at upper left of Spica at about 3.5° arc degrees away. If you see a fuzzy circular patch (and maybe even a tail!) at the location indicated in the above image, congrats!!! If time permits, I will be updating similar ISON finder charts for the next few days. Clear skies and good luck comet hunting! The topic for this coming Monday's free public stargazing talk at Toa Payoh Public Library is "Comets & Meteors". Will elaborate more in a separate blog post. Stay tuned! Kudos to StarHub and Discovery Science for promoting this month of November as Space Month! - Aliens: Are We Alone? - Alien Invasion: Are We Ready? To find out the programme schedules, go to http://tvguide.starhub.com and type in the name of the programme in the search field located near the top right-hand corner of that webpage. Alternatively, you may type in "423" or "Discovery Science" in the search field located near the top left-hand corner of the webpage. Click on the Discovery Channel logo and see a listing of the upcoming programmes. You may set up an sms alert for any of these programmes by selecting the "Alert Me" tab option located in the right-hand margin of the webspage. Please read the official terms and conditions and FAQ/user guide for more information. Programmes marked with an * are DVDs that can be borrowed from public libraries. Go to http://catalogue.nlb.gov.sg and search for them to check if they are available for loan and at which public libraries.